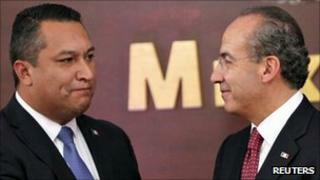 Mexican Secretary of the Interior Francisco Blake Mora, who has died in a helicopter crash at the age of 45, was the key figure of the government's fight against violent drugs cartels. He also led efforts to reform Mexico's notoriously corrupt police forces and justice system. President Felipe Calderon has paid tribute to him as "a great Mexican who loved the country he served until the moment he died". "Mexico has lost a great patriot and I have lost a great friend," he said. A lawyer by training, Mr Blake Mora began his political career in his home state of Baja California as a member of President Calderon's conservative National Action Party. At a local level in the city of Tijuana on the US border and then at state level, he established a reputation as a determined and effective enemy of the drugs cartels. It was this that led President Calderon to chose him as Secretary of the Interior in July 2010, even though he was inexperienced and relatively unknown at the national political level. The post of vice-president does not exist in Mexico and the Secretary of the Interior (Secretario de Gobernacion in Spanish) is effectively the second-in-command, similar in some ways to a prime minister. The role involves managing the president's relations with congress and the opposition, as well as responsibility for domestic policy including migration, human rights and - most crucially - security. Mr Blake Mora proved a staunch advocate of President Calderon's increasingly controversial policy of using the military to confront the drugs gangs, despite rising levels of bloodshed. He travelled frequently to the cities and regions worst-hit by drug-related violence, promising army and federal police support to local forces struggling to cope with the power and ferocity of the cartels. His death is being seen as a major blow for Mr Calderon's government, which has made the drugs war its overriding priority. Mr Blake Mora leaves behind his wife Gloria Cosio and a young son and daughter.